Maastricht – 18th June, 2018— Transform Data International, the European channel partner for the Repstor product portfolio, today announced a new partnership with Abakion, a Gold partner of Microsoft in Denmark focusing on Dynamics NAV and Dynamics CRM. The new partnership will see the creation of an integrated financial and matter management solution for the legal sector based on a Microsoft Outlook© single interface. 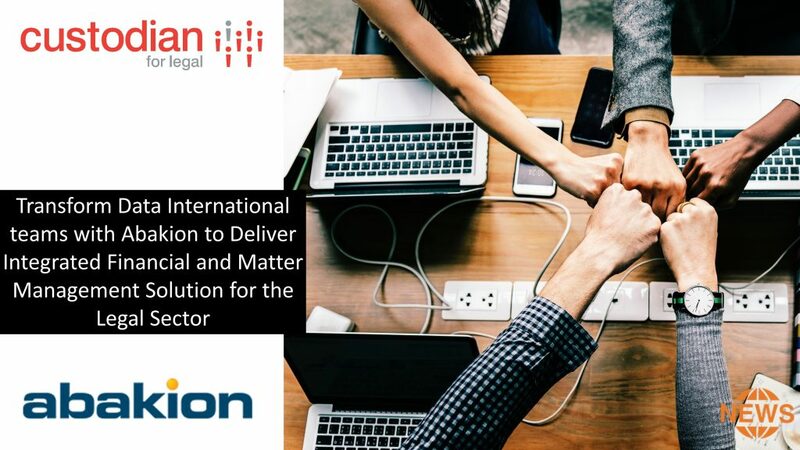 Custodian for Legal extends the powerful document management and collaboration capabilities of Microsoft Office 365/SharePoint providing an Office 365 for Matter Management solution. Custodian for Legal offers the user a fully integrated Outlook experience including full offline functionality, search optimization, metadata support and email management. Legal365 is a Certified for Microsoft Dynamics” Legal practice management solution. Legal365 helps law firms save time with case management integrated with Outlook and cloud-based accounting, all based on Microsoft technology. It includes a complete ERP system with invoicing, documents, time recording, billing and accounting. Abakion A/S works from wonderful Copenhagen in Denmark, not far from the Microsoft Development Center. Abakion is specialized in industry solutions based on Microsoft technology, hosted on Microsoft Azure, and integrated with Microsoft Office and Microsoft Power BI for Business Intelligence needs. Abakion holds the highest certification at Microsoft and their our solutions are all reviewed and certified by Microsoft.